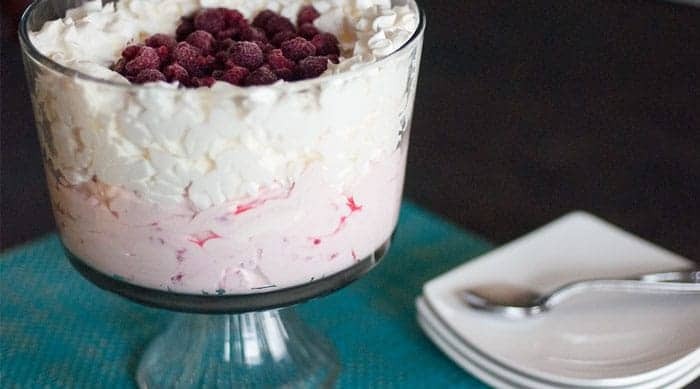 Raspberry cheesecake dessert salad is a quick and delicious recipe. Make for last-minute get-togethers or dress it up for a special occasion. If you’ll be feeding a large group, you’ll want to double the recipe (at the very least!). Hello and welcome! 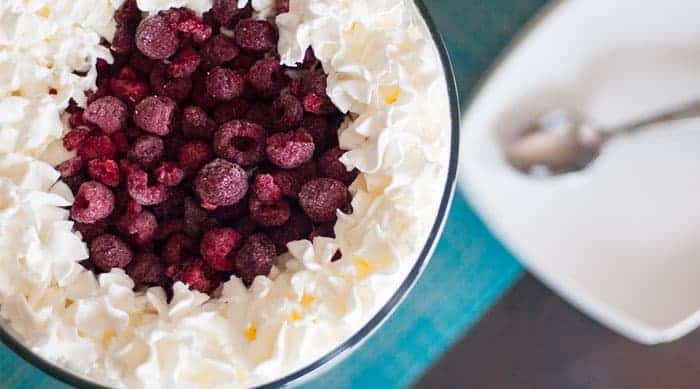 Today I’m sharing one of the easiest dessert salads you’ll ever make. 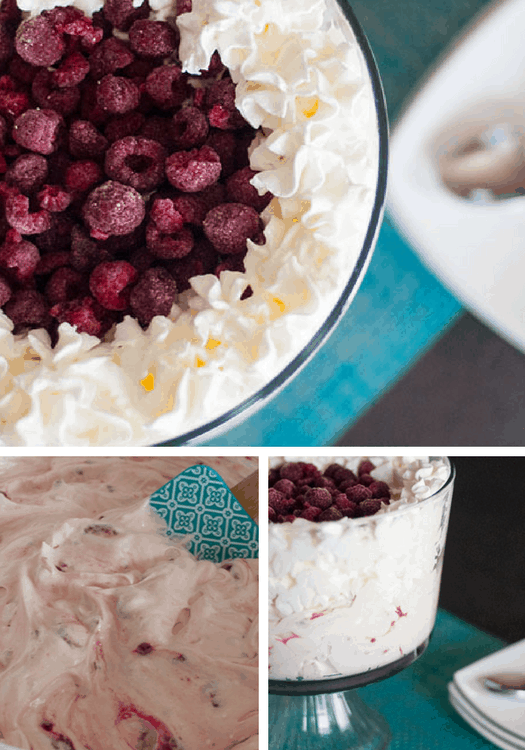 It’s a raspberry cheesecake dessert salad that is so delicious. And it literally takes 5 to 10 minutes of prep time. So awesome. Invited to a barbecue or potluck last minute? This is the perfect salad to whip up. Or dress it up for a bridal or baby shower. But whatever the occasion be prepared to share the recipe. Luckily it’s an easy one! Begin by mixing the vanilla yogurt and Cool Whip in a medium-sized bowl until smooth and creamy. Next, use an electric mixer or whisk to mix in the Jello Cheesecake Pudding Mix. Don’t worry if there are a few chunks they’ll smooth out later. Fold in 1 small package of frozen raspberries. Refrigerate for at least 1 to 2 hours. This will give the raspberries a chance to thaw and flavor to spread into the cheesecake mixture. When you take the salad out and stir it, it should be a beautiful pink color like the picture below. You can serve exactly like so, or dress it up in a trifle bowl or fun serving bowl. (Be sure to double or triple the recipe for larger bowls/larger groups.) 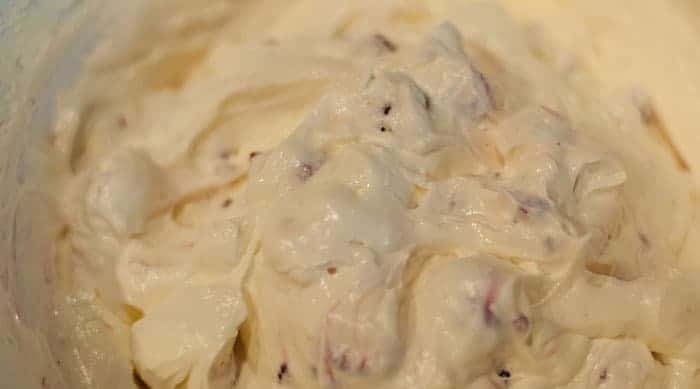 First add the raspberry cheesecake mixture, then top with Reddi Whip around the edges and fill the middle with the second bag of frozen raspberries. Please stop and say hi in the comments. Have you made a salad like this before? We’ve tried making it with peaches instead of raspberries — not quite the same! And that’s hard for me to say because I am a peach freak. A raspberry cheesecake dessert salad that is so delicious. Not to mention it’s super easy. 10 minutes and you’re done. In a medium-sized bowl, blend the vanilla yogurt and Cool Whip. Add the Jello Cheesecake pudding mix and blend with a whisk or an electric mixer. Fold in one small package of frozen raspberries. Refrigerate 1 to 2 hours before serving. This will allow the raspberries to thaw and add flavor to the cheesecake mixture. Optional – add to a trifle bowl or fun serving bowl. 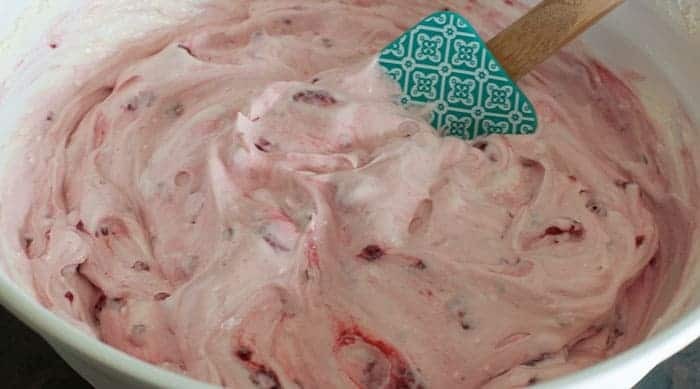 On top of the cheesecake mixture, decorate with the rim of the bowl with Reddi Whip then add the frozen raspberries to the middle. 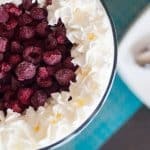 The easiest dessert salad you’ll ever make! Allowing the salad to set in the fridge for a few hours will bring out the raspberry flavor. Oh, yum! I’ll have to try this one! Yes, so good! 🙂 It’s one of our favorites and so easy to throw together. Thanks for stopping by to check it out! Oh my gosh that sounds great. I’m a huge cheesecake fan and love raspberries too. Sounds like a good dessert to have over this holiday weekend! Thanks for sharing. Yes! Perfect for the holiday weekend. 🙂 I appreciate you stopping to check it out. Enjoy your weekend!